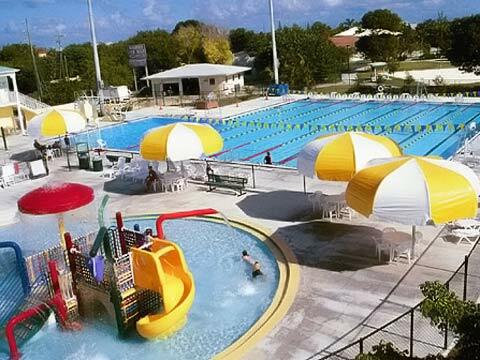 Jacobs Aquatic Center is a 3 pool complex located in Key Largo Florida featuring: A 25-meter 8-lane MYRTHA competition pool (5-7â€™ deep) with Colorado timing system, and contiguous diving pool (12â€™ 3" deep) with one 3-meter and two 1-meter diving boards, also suitable for SCUBA certification, synchronized swimming, and water polo. A 24â€™x44â€™ ramp-accessible multipurpose MYRTHA pool (3-4â€™ deep) for swim classes, water aerobics, aqua therapy, and recreation. An interactive play pool/water park (12-18" deep) featuring a Pirate Ship, "spray" gym, and "beachfront" entry. Programming offered includes Youth Swim Team Masters Swimming Swim Lessons Water aerobics/pilates American Red Cross Gymnastics Lap Swim / Open Swim The lap pool is an 8-lane, 25-meter, heated swimming course equipped with a diving well plus 1 and 3 meter boards. Therapy Swim Our therapy pool comes equipped with stairs and/or a handicapped ramp entry and it is heated. Great for physical therapy, learning to swim, or just relaxing. Children's Interactive Water Park - tons of fun for kids of all ages Bring the kiddies to splash around in our handicap accessible Activity pool. Complete with Buccaneer Pirate Ship, Water slides, Playground and Waterfall. Florida Keys Swim Club * Swimmers ages 18 and under. This program is designed to help you set and achieve goals, whatever they may be. From Fitness swimming to competition. We will achieve these goals through learning stroke technique and efficiency in the water. We only move at a pace with which you are comfortable. Practices Monday, Wednesday, and Friday at Founders Park. Practices Tuesday, Thursday, and Saturday at Jacobs Aquatic Center. Cost: 3 or less practices $60 per month Cost: 4 or more practices $70 per month United States Swimming Registration Required Annual fee of $55 Masters Swim Club* Swimmers ages 20 and up. This program is designed to help you set and achieve goals whatever they may be. From fitness swimming to competition. We will achieve these goals through learning stroke technique and efficiency in the water. We only move at a pace with which you are comfortable. Practices M-F 6:30 AM 8:00 AM; Cost $60 per month Water Aerobics - Come splash your way fit! With Kelli Cuppett, Master Certified Water Fitness IT and Personal Trainer. Deep and shallow water classes available. Days/Times: Mon., Wed., Fri.: 9 - 10 AM With Sue Houston A.E.A. certified instructor. Shallow & Deep water classes are available. Days/Times: Learn to Swim Group lessons are available at $50 plus tax for a four-lesson session. Each lesson is a half hour long. All ages from 6 months and up are welcome to participate. Please come by the pool to register. Private adult or child lessons are available upon request. Lifeguard Training Program Students must be at least 15 years of age. This Red Cross class will teach the skills necessary to work as a lifeguard. Call or stop by the pool to sign up for classesConference Rooms & Special Events Need to host a special meeting for up to 100 people? Do you need a "Special Location" to host a family, corporate or fund raising event? We have Conference Room Facilities available with state of the art Audio Visual Equipment for video/Power Point presentations. Please call us if you would like to make arrangements to use TIB Bank of the Keys' Community Room. The "Aquatic Center" may be a perfect place for that "Special Event." Call Danielle Bosworth at JAC, 453-7946.